I work as a Chief Mate on U.S.-flagged oceanographic research ships . The voyages and expeditions I have worked brought me from the Yangtze River of China, to the icebergs off Cape Horn South America, Antarctica, and many other points around the world. My passion is world travel and I have spent the last 13 years working and independently traveling through over 90 countries. I have no home and live out of a backpack (although a girl in Taiwan has me settling down for the first time in my life). I also love to read literature, study history, and make trouble where and when I can. Traveling to North Korea has been a life changing experience but it’s far from being my only one. I have hiked at Mt. 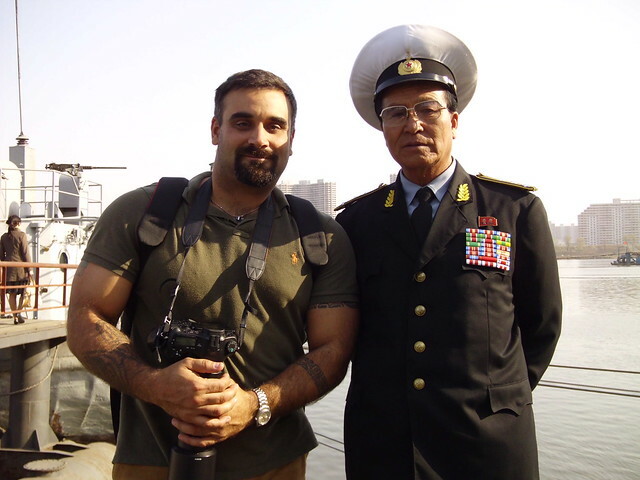 Everest, worked as a white water rafting guide, hung out with rebels and liberation armies in various war zones, been killed off in a Chinese kong fu film, studied Vietnamese at a university in Hanoi, and most recently I received the US Coast Guard’s highest license, Master Unlimited. With girls in Wonsan City. At a Pyongyang folk festival. 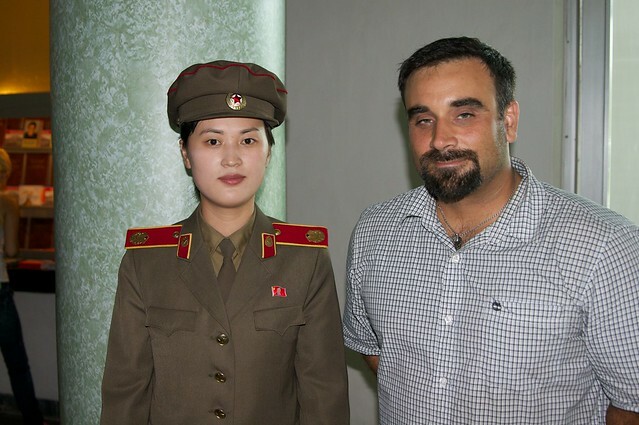 With my “secret North Korean girlfriend”. 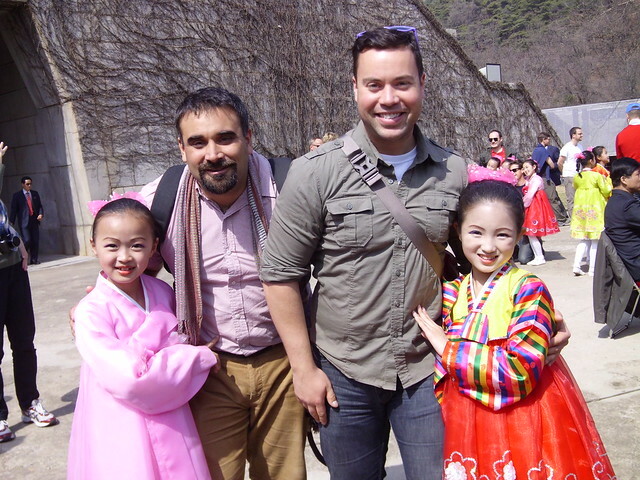 With a North Korean guide. 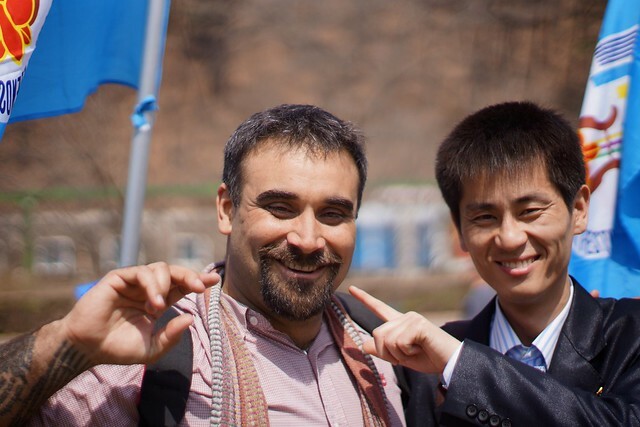 With North Korean guide Mr “crazy” Kim. 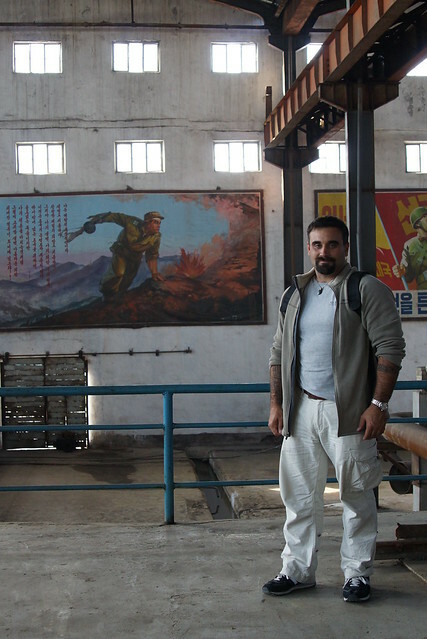 Revolutionary art at the Hamhung Fertilizer Plant. 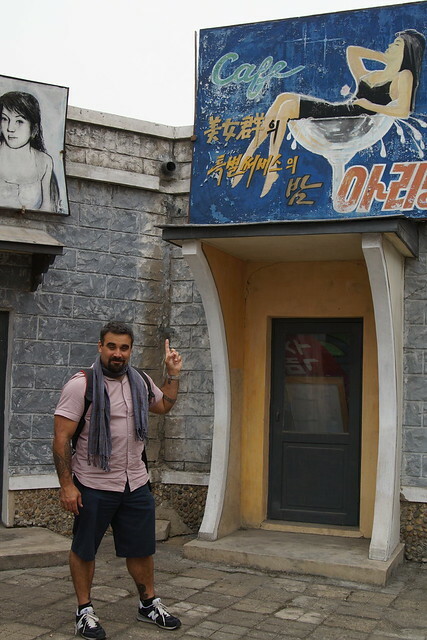 At a South Korean brothel at the Pyongyang Film Studio. 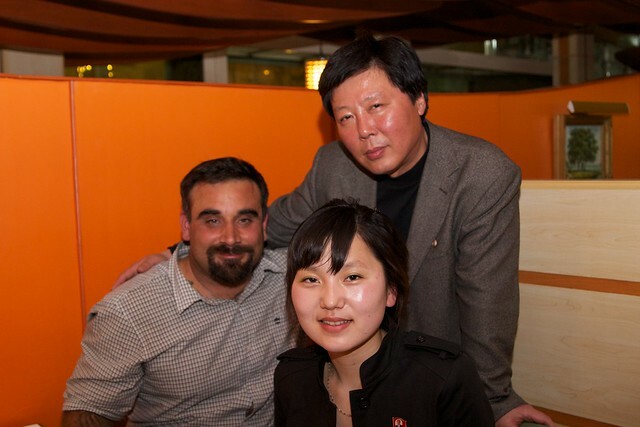 Photo with the director of the Korea International Travel Company. With my lunch at the Pyongyang gun range. Waitresses at the North Korean restaurant Dandong, China. 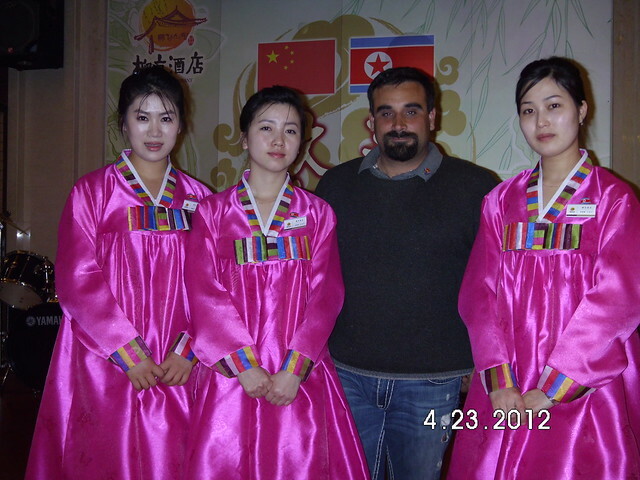 With the singing waitresses of Pyongyang, North Korea. Cute times with the singing waitresses and myself at the Youth Day Celebration , Pyongyang, DPRK, North Korea. Dancing with the singing waitresses of Pyongyang, North Korea. Group photo at the Reunification Statue, Pyongyang. 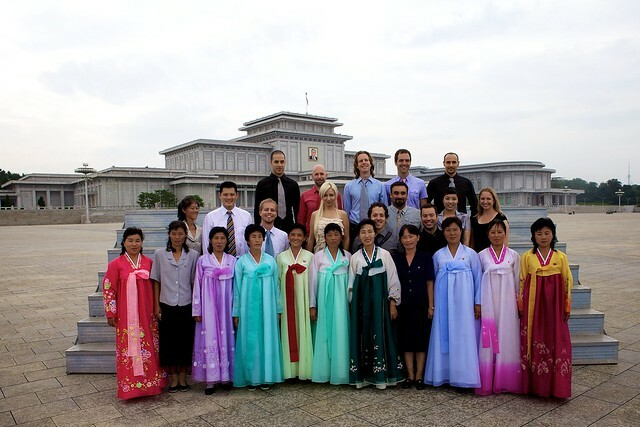 Group photo with colorful Korean natives outside the Kim Il Sung Mausoleum. 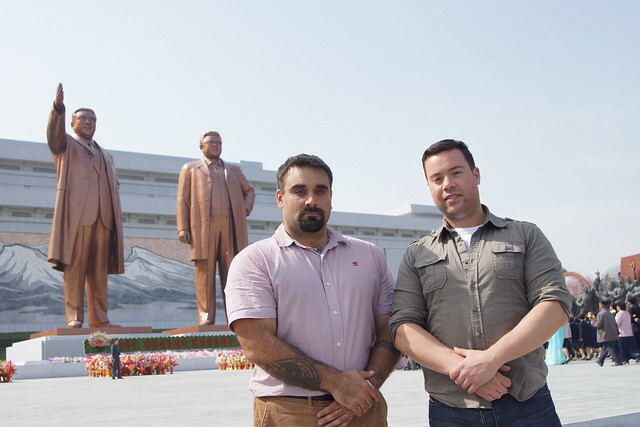 Our crew outside the Kim Il Sung statue in Kaesong. Taking on the North Korean strong man – arm wrestling at the Pyongyang fun fair. The group at the DMZ. After one too many at the Pyongyang BBQ duck restaurant. I was trip leader! 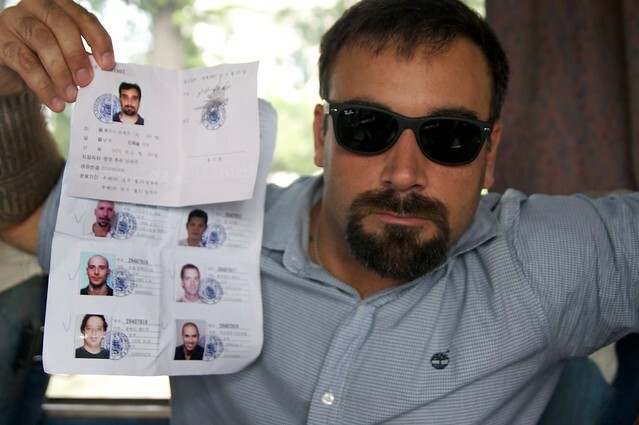 Here I am showing off our North Korea group visa. Just a little drunk after a night of North Korean karaoke. She hates American soldiers but “love(s) American civilians!” – with the guide at the Victorious Fatherland Liberation War Museum. I’m a sailor, I dig anchors! Three Revolutionary Ideas Exhibition, Pyongyang, North Korea. View of Pyongyang from the Grand People’s Study House. With the guide at the International Friendship Exhibition. Below the Kims at the DMZ. 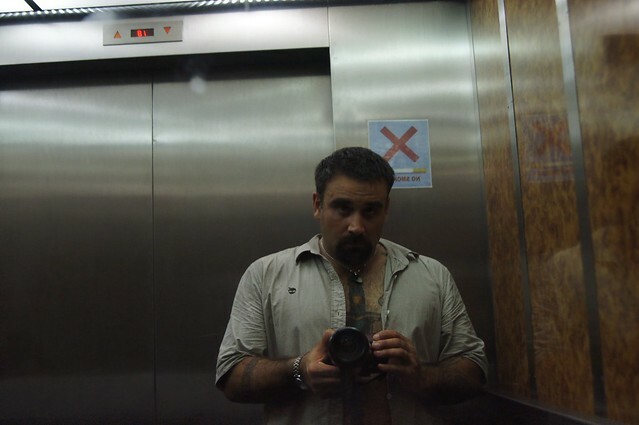 I’m glad to have found your blog and I’m looking forward to your photos and thoughts on visiting there! Hi Joe, if you don’t mind me asking, How were you able to work in Korea? I would like to follow a similar path, how would I go about doing like you do? Yes, your life sounds very adventurous and interesting. I am looking forward to your pictures and thoughts aswell. Hey Joe, Do you live in North Korea, or are you just enjoy visiting North Korea? 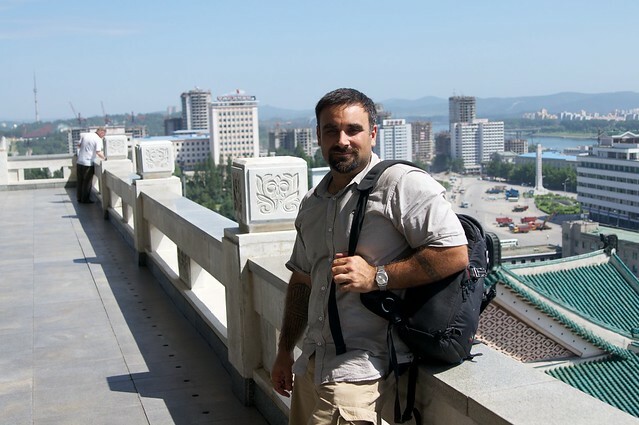 Hi Brad, I work as a tour guide in the DPRK during vacation time from my real job, entering the country via China – I do about 6 trips a year now. Salamat, and thanks for stopping by. I definitely plan to continue to keep posting something new and fresh each day. Walay sapayan – actually I lived in Cebu for a summer and took some classes in Visayan and studied some martial arts. I checked out your blog too, nice work, I will be following it – happy travels! Sounds like you have had a lot of interesting wanderings.. 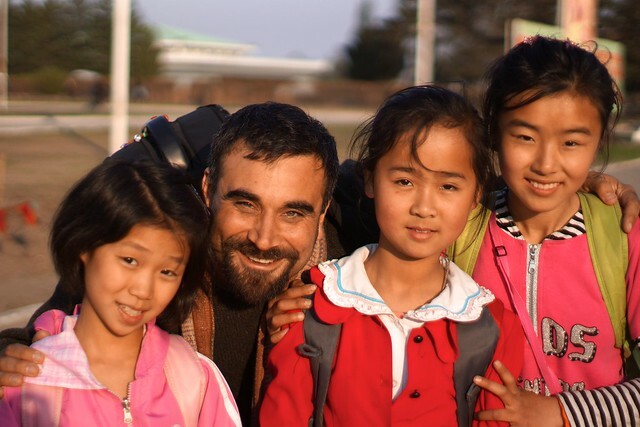 I just saw your North Korea photos on flickr and they are simply awesome!i love the portrait photos,especially the children ones.It seems like you had a more inside view than other tourists. Thanks – I read your bio, you have had an interesting life’s journey, so cool you are so well grounded and your love for the world trumps all the superficial distractions out there! Best of luck in everything. I envy you! I’ve never been in North Korea even though I’m from other side of Korea! Thank you for sharing all pictures and traveling stories as well. I should spend some more time here! Thank you, this blog has slowed down a bit now that my first trip was last summer, but I go back in April of this year so there should be plenty of new and fantastic pics coming – I upgraded to a pro camera for my new trip! 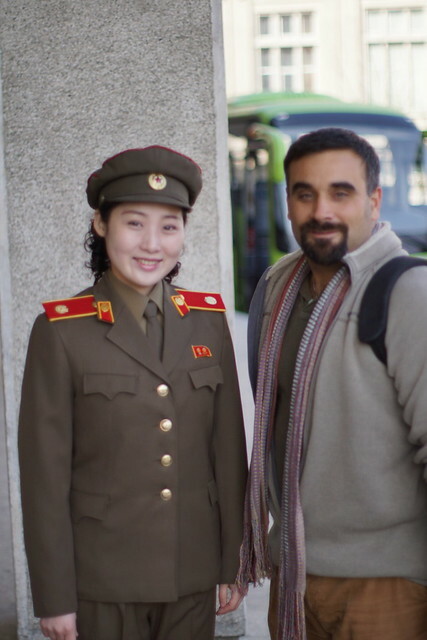 Hi Joseph, I found your blog through a few key words on Google and so far this is the best blog about North Korea I’ve ever encountered. I’m not having any biological or physical attach to the country, just the emotion! Pleas keep your blog rolling. Amazing pictures and stories..thank you for sharing! Great pictures and blog. 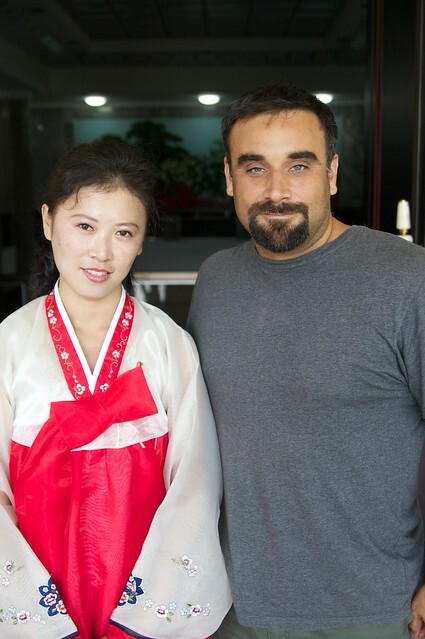 It’s fascinating to get a glimpse of real NK citizens. 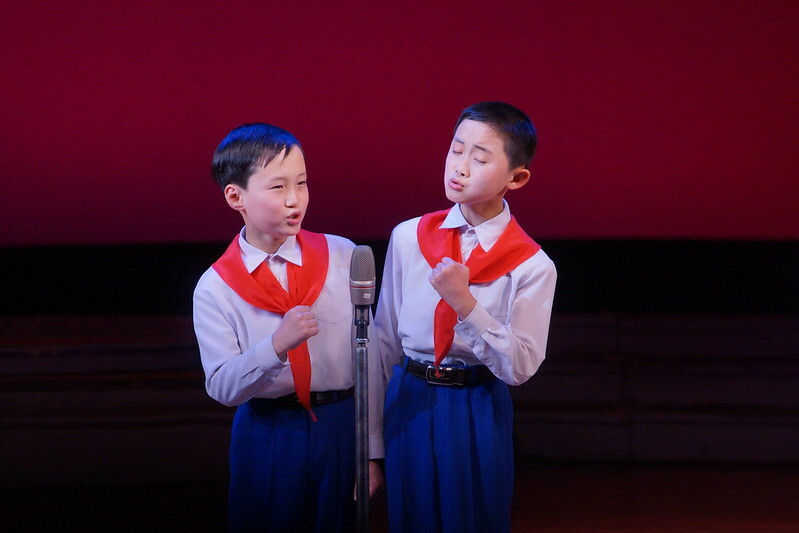 I’m sure there is so much that you can’t see, but photos like these, where we see a few North Koreans smile, dance, and let their guard down for a few seconds, are very illuminating. Thanks for sharing. glad to see pictures of N. Korea. Hi Joseph, your pictures are amazing. 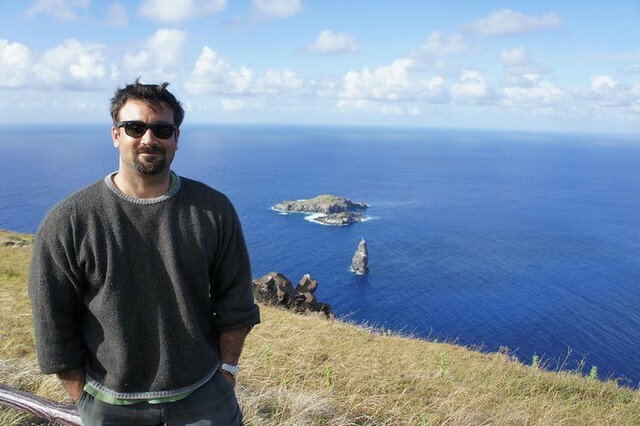 Your blog is making me want to get a round-the-world ticket! Best of luck in your travels! Btw, you mentioned you lived in Cebu, I was there not too long ago. Maybe I even saw you in Ayala or SM. lol Anyway, salamat sa mga pictures! Fascinating blog! I’ve read that Pyongyang is different from the rest of DPRK because it’s the home of the governmental, financial and military elite, so the people look happier and more affluent than people in the rest of the country. What’s your opinion on that? You are certainly correct, Pyongyang is home to the governmental, financial, and military elite, and is a showcase city with all the facilities and luxuries for the politically reliable that have been rewarded by being allowed to live there. For the most part the people of Pyongyang seem to be content with the modest housing and food provided by the state. The money they make with their jobs is extra and usually saved to fund weddings and other special events. Luxuries such as TVs are gifted from the state. Rumor has it that foreigners are only shown some streets, but we were hauled all over the city. True, there are some industrial areas that the government does not want to show, but in general we saw everything. But we did visit other cities, cooperative farms, and the countryside. Surprisingly the cooperative farms make a lot of money and the people who live there do very well financially – I’m told better than resident of Pyongyang. The smaller cities seem to have a standard of living scaled down when compared to Pyongyang but the people seemed healthy and happy enough – one of the best experiences from my last trip was being let loose on the Wonsan docks and having free interaction with locals – there were a lot of smiles, laughs, photos, and mysterious punches into my belly from some rambunctious child. We traveled through mountains and the countryside and we did see foraging, but we never got into areas were starvation was at a critical level. you idiot, those weren’t just any locals, they were all plants. they got shipped there before and shipped out after you left. it’s all a big sideshow. those women in your photos got beaten, tortured and killed btw when their minders saw your photos on this blog. Sir, you seriously are an idiot, but thanks for stopping by. Funny, because I have been there twice and have met the same people on the two trips, so if what you wrote was a joke, fine, if serious, sorry you have no idea. I’m glad I found this blog! Your travels sound fascinating; I’d be happy if I managed to visit just half of the places you’ve been. I’m hoping to go to North Korea after college, and was wondering if you have any travel recommendations regarding the agencies and tour groups that visit DPRK. Apologies if this answer can be found somewhere on your blog — I poked around but didn’t find it. Thanks, and I’ll be sure to check back for new posts! what a awesome adventure , i really admire your courage to explore the unexplored world need lots of strength and courage . Explore BURMA and Naga in Nagaland India , i bet you will have a great journey ,this part of the world need to expose to the world . 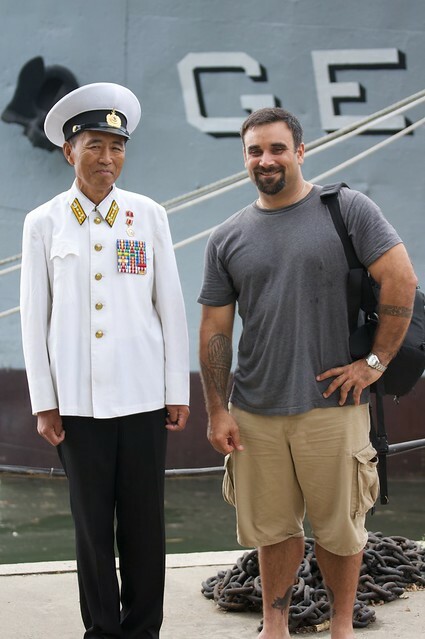 Thanks Ray, I actually worked in a Kong-fu film in Myanmar – I was with a Chinese film company that had paid off rebels and were sneaking us across the border from Yunnan into the jungle to do filming every night. I died three times in the film – twice by elephant! Alas, this was back in 2003 and all I ever learned was that the production ran out of money and never got released. Of course that’s not the same as traveling in Myanmar – it’s been a destination high on my list – someday. Awesome reading, good luck with the rest of your travels. Would love to get DPRK on my flagcounter if possible? Great pictures! Every once in a while I find a great site online and yours did not disappoint! Wow!!! How interesting! I’ve travelled a good amount, but I’m an agoraphobic compared to you. thanks for such amazing pictures. I am deeply intrested in taking a tour package trip tp North Korea sometime in MArch or April. What company did you travled with and where was the gun range- bar located ( soundslike fun)? Any how, can you please provide with the companie’s name and the lenght of the tour as well? Hi Jose, could you please contact me at josephferris76@yahoo.com , I can definitely sort you out with a March or April trip with a visit to the gun range, all with 5% off via my referral. Very cool blog. 🙂 What got your started with your fascination with North Korea btw? Have always wanted to go since it has been off limits to Americans for so long. Now after a couple trips I’m starting to work in the tourist industry there – I love it, fascinating place and the people are lovely. You have done it all LoL! Excellent. A real enjoyment to view and read Joe! 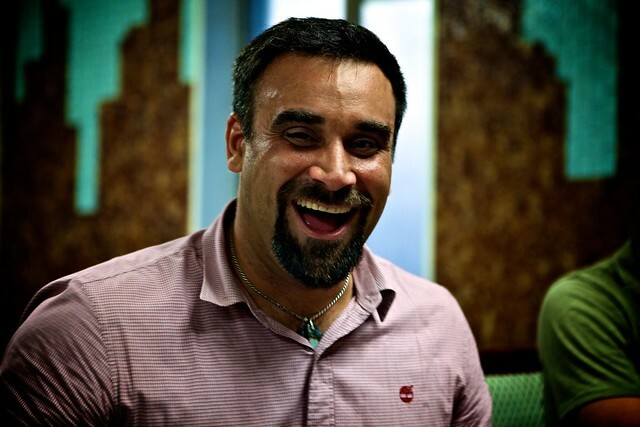 Joe, great blog and thanks for all the great pictures. It’s also really nice to see someone be respectful of the country and the people and not conflate that with any political opinions. Keep up the great work, I’ll hopefully be sending you some money for your blogging from with NK adventure as soon as I can. Also, when you donate, make sure you send me your info! Hello, can you comment on collectivized farming in North Korea? From my understanding of history it seems like socialism and collectivism work best in the cities and in industries that become monopolies under capitalism (i.e. American’s healthcare business) but often fail in agriculture. In the Soviet Union this was largely due to misunderstanding of rural culture (among many other problems). How does farming work over there? I’m going to the Chonsamri cooperative farm in just a few weeks, if you have some specific questions you would like me to ask I’m willing to try for you. I’m glad I stumbled upon your blog, Joe! If I could see a fraction of what you have seen- I would consider myself very lucky! I’m curious- who are the other people in your group? Your friends or other people just adventurous enough to go to North Korea? I was surprised to see so many americans there, given its reputation and warnings from the government about the dangers. Is it really not as difficult to tour North Korea and other risky countries as they make us think it is? I am asking because I’m going on a group tour of Israel and am considering heading to Egypt on my own, which is not the safest place right now. I want to be safe but I also want to experience the world! I actually came across your blog by trying to collect information on this topic. =] Hope to hear back soon! 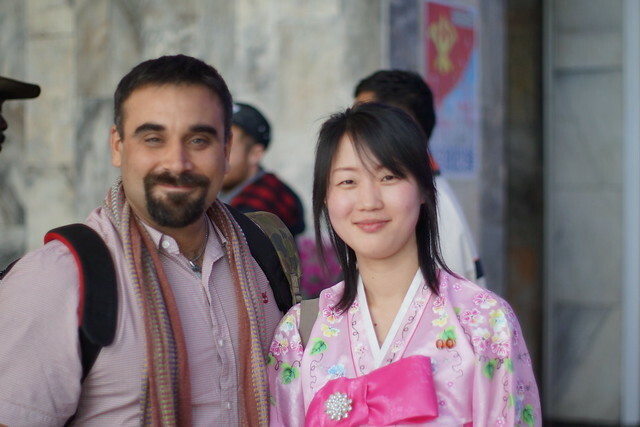 Hi Sam, my private custom trips are normally Americans aged 25-40, who are adventure seekers, cultural ambassadors, and entrepreneurs – and all fun loving people, with the right attitude North Korea can be a lot of fun believe it or not. My companies group trips tend along the same demographics, although mixed Nationalities. Although tensions are raised, North Korea is one of the safest places to travel on a tourist visa. 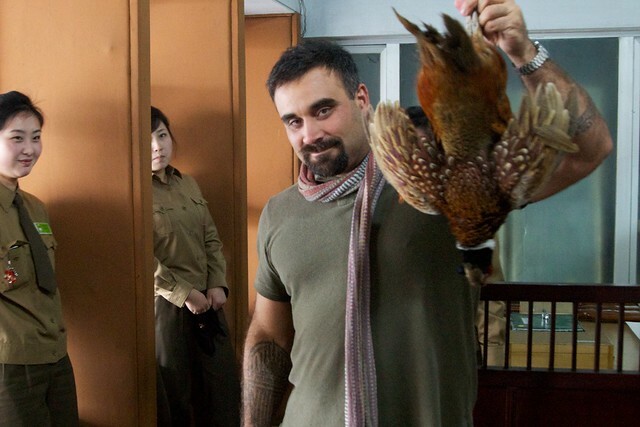 You are taken well care of by the North Korean guides, and petty crime is non existent – kinda the same as traveling to Iran, probably safer in those two countries than anywhere else. For me, risky countries are places like Bolivia, Costa Rica, South Africa, ect. Places with developed tourism but with crime problems – there tourists ARE a target – I have, or my friends have been mugged in these places. But a bad experience will not prevent me from traveling or exploring the world. 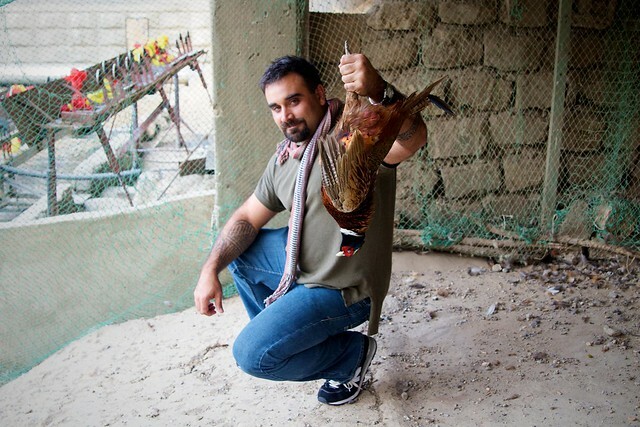 I was just in Lebanon this year, “risky” but amazing. If you picked your destinations by government warnings you couldn’t go anywhere – I’m sitting on a beach in the Philippines right now, biggest danger to me will be a sun burn, fire coral on my dive today, or a hangover. I suggest getting out there, but be smart about it, you already understand political tensions could heat up in Egypt – just have secondary plans if they do right before you go, but if things are quiet, why not go? I’m thinking about Egypt myself this winter, a little diving in the Sinai. wow you are awesome!!! when it comes to North Korea, I will just have to live vicariously through you. Wow visa for that must be…hard is a way to put it. You wnjoy this so much 🙂 question, what is it like to fly Koryo Airlines? “Strange” leaves a lot to the imagination. Can you be more specific? BTW, I enjoy reading your blog and viewing your Flickr photos. Interesting to read about your experience in north korea. I felt kind of bizarre and “weird” for wanting to visit this country, but It would be realy exciting to do once in a life time. One thing is the fact that Pyongyang is a totalitarian state, another fact is how it is while personally experiencing the place. The tabloids are always experts at twisting the truth to get readers/attention. I read that mainland china have denied north korean flights landing at their airports. North korean people seem sweet and nice. It’s just a pity that generations of indoctrination has given them a twisted view about the “outside world”. Is it difficult to obtain a visa after mr Un took over his fathers throne and what is the fastest and most comfortable route into DPRK? 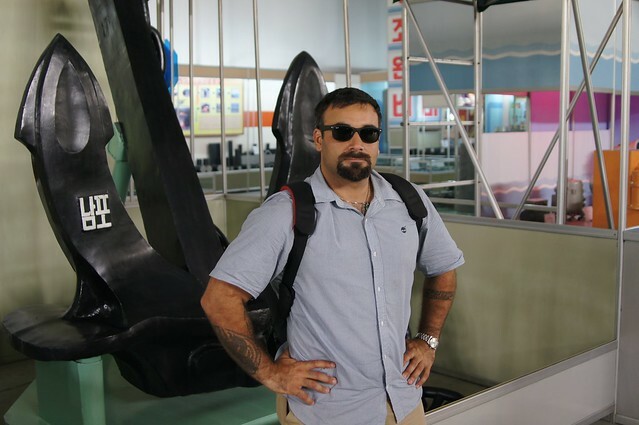 Great Blog I remember being here awhile ago but didn’t you use to have a video about your trip(s) to the DPRK? I really don’t do much work with videos, I did try to start a new youtube page in an effort for more video but never got around to it, two jobs and my still pics keep me busy enough. Thanks so much for sharing the awesome pictures! I can’t wait to see more pictures from your trip this time. I hope I will be able to visit DPRK soon! 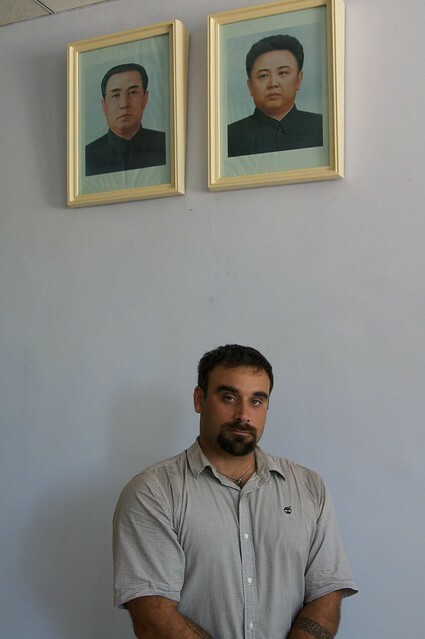 Hey Joseph, just stumbled upon your site, it’s really interesting to see your beautiful pictures from the DPRK. 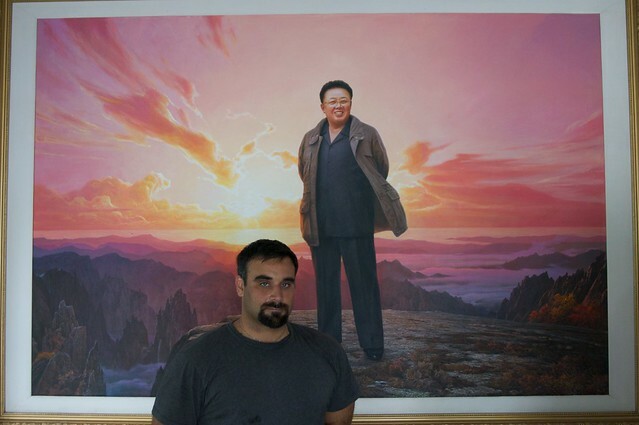 I will be going for 2 weeks there in August with Juche Travel Services next towards a China tour and I was specifically wondering which camera did you use to make these pictures, and also, how were you able to make some of these? I mean I know according to travel agencies that you may only take pictures of the soldiers at the DMZ, but here I see you making all these marvelous and personal photos with the locals, soldiers, children, guides and more. What are the tips you can give me, or is it just a simple way of asking? North Korea is a special nation after all. You can email me. Hopefully I will have a buddy in my group to make great pictures like you did! 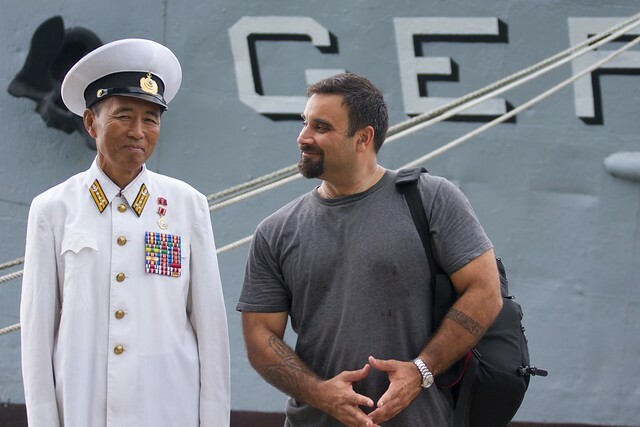 I’ve been to North Korea with Cap’n Ferris three times and can honestly say that he the man to go to DPRK with. He has a lot of good friendships in there that really enhance any tour he is leading. Most guides have to stick to a schedule but he can randomly get you into something spontaneous that pops up just by simply asking. A phone call and a short detour later and you’re witnessing something amazing that was totally unplanned. I highly recommend him. His tours are great and he goes out of his way to take care of everyone in his group. He’s totally reliable and responsible. i am Danang from Indonesia. i really curious about north korea and thinking to visit on August 2014. are u will be there at that time? how about the security there? is it safe for Indonesian like me? for Mass games is it only available on August? Hi D, mass games normally run from end of July to mid Sept. This was the last year for the Arirang version, I have not herd yet of their plans for 2014, but will post as soon as I know. If work allows I will be guiding our Aug. Mt. Peaktu tour end of Aug. Im sure I will have another Aug. tour or two but its too early to know. Hi Joseph, did you mean there will be another version of mass games rite? hopefully it will more spectacular. i think i will be there on late august tour with YPT. hopefully we can meet.